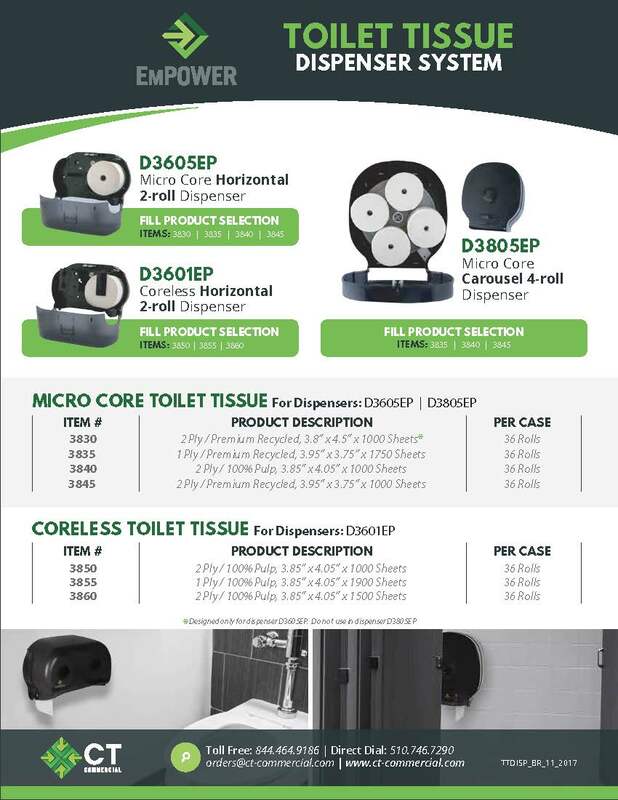 CT Commercial has a full offering of both Micro Core and Coreless Toilet Tissue products, as well as full dispenser support for these items. Regardless of who your current supplier is, CT has a system Gateway to move your business into our superior quality products. The CT Gateway provides you with products that allow customers to transition away from suppliers that either cannot support dispenser fill needs or suppliers that cannot offer dispenser support for product. CT products strategically work in most systems to allow you, the end-user, to both fill existing dispensers and replace those with CT Dispensers on a reasonable schedule. CT...EmPowering customers through superior quality dispensing and paper products. 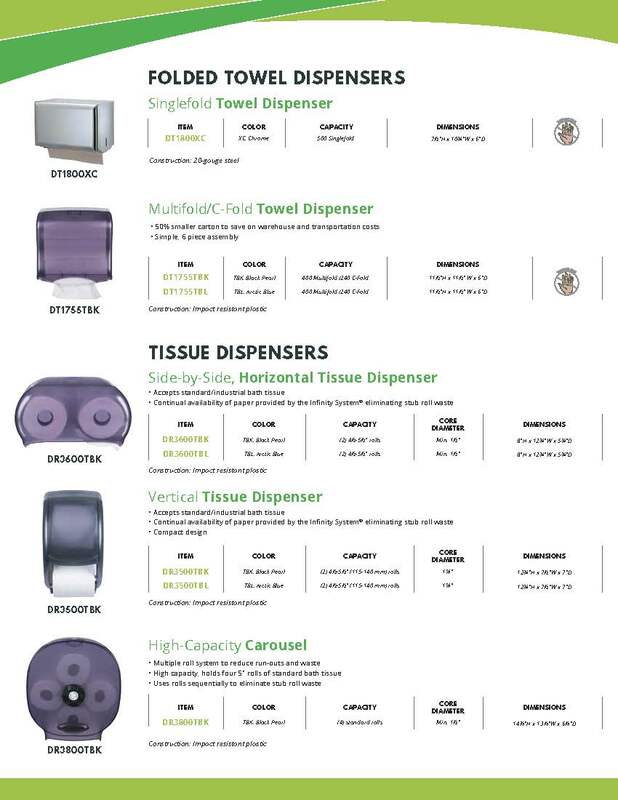 CT Commercial Holdings is pleased to reveal the complete list of Universal Dispensers. Numerous models with varying specifications are available to effectively match any needs. These dispensing options are made of impact resistant plastic and available in two colors: Arctic Blue & Black Pearl. Whatever your needs- CT Commercial has a dispenser for you. In a world of staggering environmental challenges, CT Commercial is proud to introduce the first of our newly developed Belfair Natural line of renewable fiber products. 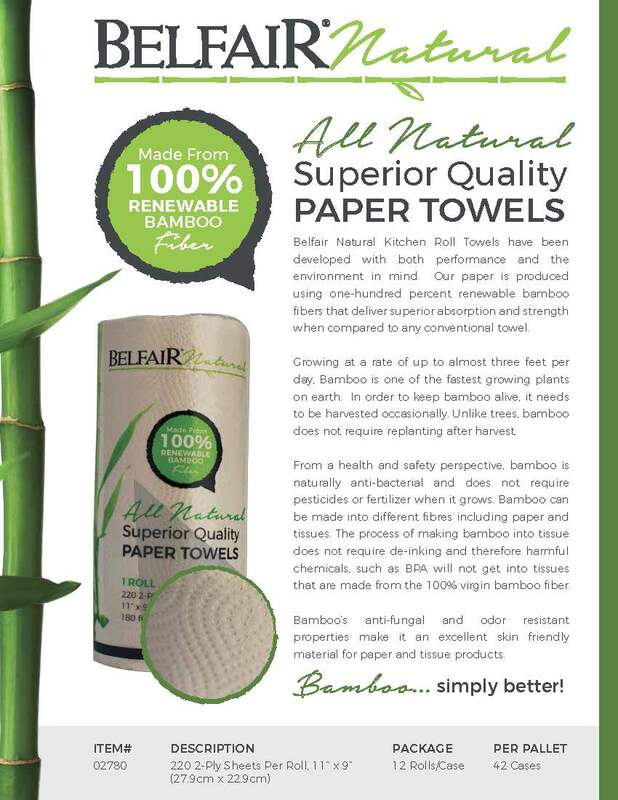 The new CT Commercial Belfair Natural Kitchen Roll Towel delivers unbelievable superiority in a Kitchen Towel while relying on renewable Bamboo fiber to create the basis paper. A rare combination of strength, absorption capacity, environment, and economics, Belfair Natural Kitchen Roll Towels are simply better! Off Fold napkins are one of the oldest and most common dispenser napkins in the market. As CT Commercial continues to grow our high quality napkin offering, this is a great new product selection that helps our distribution either transition to or extend business with CT Commercial. Available in both White and Kraft Recycled blend, these are great new products for CT, our distribution channel, and end-users alike. CT Commercial continues to push forward with product innovation and improvement. Our new Kitchen Towel line includes our new SmartSheet feature, delivering our customers the ability to get twice the volume of sheets by opting for half-sheet sizes when smaller sizes fit the need. Additionally, our two new roll sizes of 170 sheets and 220 sheets use our new SmartPak system that delivers an additional 90 full-size sheets in the case, but reduces the case size up to 44%. Greater value, less waste, and superior performance! Contact your CT sales representative for samples today! Everyone loves a bargain! We have one for you in our Vista Multifold Towels. Do yourself a favor and contact our customer service department or your sales representative today to take advantage of this exceptional quality towel at an unbelievable price point. This deal won't last forever, so don't hesitate. And soon we will be introducing even greater value with two new larger size rolls. See more details by viewing our announcement or call our customer service department for more details or samples.